So simple but so lovely…. Did it take long for you to spot the man in the door? Nice! I couldn’t see it at first, now I can see nothing but! A spilt second. It’s looks as though it is the face of Neil Gaiman. Saw it immediately. Yay pareidolia. stil looking , can u give me a hint? Please look from some distance. The shadow of the tree on the building/ door is creating a human face. Straight off. Is it shopped? It’s sweet. What is it that happens in the brain with images like this? One minute you see nothing, then it’s as if a switch clicks and you see something. I can feel something happening in my eyes, too. First glance, maybe because I knew I was looking for a face. 2 seconds, but if you had NOT said ‘in the door’ it may have taken longer……you gave it away !! It took perhaps 20 seconds. Of course, now I can’t NOT see it. It’s Steven Seagal … and he’s pissed!! Saw him straight away. Cool illusion. Yeah yeah, some of you have super brains that see this stuff straight away. I have never been able to see those magic eye things either. So bog off with your ‘I saw it instantly’. Neither have I, but this isn’t like that, this is pareidolia (seeing faces in shapes). Nothing to do with super brains, it’s just something some people see faster than others. It’s not related to IQ or whatever. Did you read the title etc before looking at the pic? and were then thinking about faces,ears, hair etc when you looked at the pic? 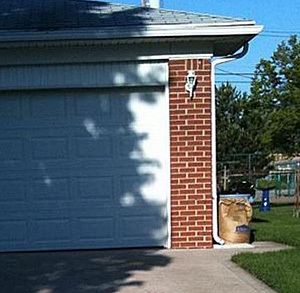 The face was the first thing I saw on the whole page, I then had to double-take to see the garage/garden, then I read the blub and had to hold back the ‘I saw it instantly’ . I agree it’s not an IQ thing. Not a number but a free man…on a door? I see Rod Stewart… and can’t make me see anything else. It took about a minute of me looking at it, but after that minute I decided to back away from the computer screen and it was almost instant. Great effect. Berber Anna – I know it’s not IQ related, it’s just annoying when people say triumphantly that they see things instantly and I don’t because their brains work faster in that area. Very nice. It took me several seconds. Of course, now I can’t unsee it. Crazy human brain! I didn’t see it at first, but found it with Richards hint of a man in a door. If it’s photoshop then it’s very clever. If it’s a real picture then it’s very nicely captured. Wow! That is cool. It took me about five seconds before it “popped” out at me. Maybe it isn’t a shopped photo, but perhaps it is a chopped shadow. Could the ‘artist’ have trimed the tree carefully on a calm day to sculpt the shadow? The Earth rotates too fast. 4 seconds. Reminds me of Robert Mitchum. The lawn could use a mow. It was a strange experience. For four or five minutes I was baffled. I was looking too hard at the shadow. Suddenly the negative space, where the shadow wasn’t, made the image in my brain. Wonderful! It would be interesting to see how the face moved as the wind disturbed the tree. That is amazing. Yeah, spotted it instantly. It took me a while. If not photoshopped: how fun to come across that! Can see a frontal of a face, and a profile. Spent a few seconds looking at a cartoony profile of a guy with a boxers nose before seeing the ‘real’ face. There is no man, merely pareidolia. Having the excellent health and financial resources to travel with my wife as much as possible, to see more on the globe and meet more of its people today. Hiya very cool blog!! Man .. Beautiful .. Amazing .. I will bookmark your blog and take the feeds additionallyâ€¦I’m happy to seek out so many useful info right here within the submit, we want develop more strategies in this regard, thanks for sharing. . . . . . I am no longer positive where you’re getting your info, however great topic. I must spend a while studying much more or figuring out more. Thank you for fantastic information I used to be searching for this info for my mission.